Huge 7" blooms! And what spectacular colour! These larger than life flowers will keep your garden 'roaring' all summer long. Daylilies are hardy perennials that have large and attractive blooms that are similar to lily flowers. They are very easy to grow, many of the forms are tolerant of almost total neglect and will still be seen thriving in a neglected garden long after most of the other cultivated perennial species have been choked out by the invading native plants. What most people do not realize is that Daylilies are actually cultivated as food crops in some countries, such as China and Japan. All parts of the plants are edible though it is the flowers that are most frequently used. 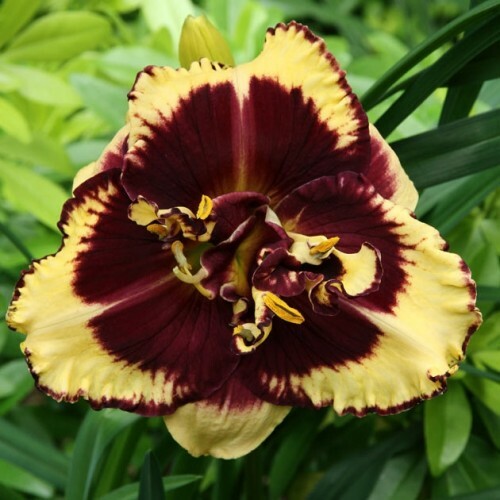 Daylilies also have a number of other uses and, all in all, deserve to become a standard plant in edible and ornamental gardens. Re-blooms. Diploid.